The scarce last derivative of Smith's map of Virginia. one of the most important maps of America ever produced and certainly one of the greatest influence. In 1694 Petrus Schenk acquired all of the Atlas Major plates at public auction from the heirs of Jansson van Waesberge, and began issuing the maps with his own imprint. This last state of the map [State 2] is uncommon and has no text on the reverse. The primary differences between this state of the map and previous states are the incorporation of longitude and latitude lines and the inclusion of a Virginia border. It is alto typically vividly colored in a 17th century hand. To fully understand this map one must first realize that most Europeans believed the Pacific, or at least some great bay that led to the Pacific, lay just a few days travel inland. In the minds of most Europeans of the period, the trade potential for the Virginia colony was entirely dependent upon it being a practical access point to the riches of Asia. Thus the significance of large apparent body of water appearing in the land of the Massawomecks, in the upper right quadrant, becomes clear. Of course, much of this land was entirely unexplored by the European settlers in Jamestown, shown here on the Powhatan River (James River), who relied heavily upon American Indian reports for much of their cartographic knowledge of the Virginia hinterlands. The Masawomecks themselves were a rival of the Powhatan and made their home near the headwaters of the Potomac. These, like many other indigenous groups of the region made only a brief and frequently violent appearance during the 17th century before entirely disappearing, mostly from disease and war, in the early 18th century. In the upper left quadrant there is an image of the American Indian chief of the Powhatan sitting enthroned before a great fire in his long house. One of the more popular legends regarding John Smith was is capture and trial before the chief of the Powahatan. Smith was convinced that his liberation had something to do with the youthful daughter of Chief Powahatan, Pocahontas, taking a liking to him. Though this grew into a fictitious legend of its own, the truth is more likely that Powhatan saw Smith and his Englishmen as potential allies against the rival American Indian groups, such as the Massawomecks, that were pressing hard against his borders. 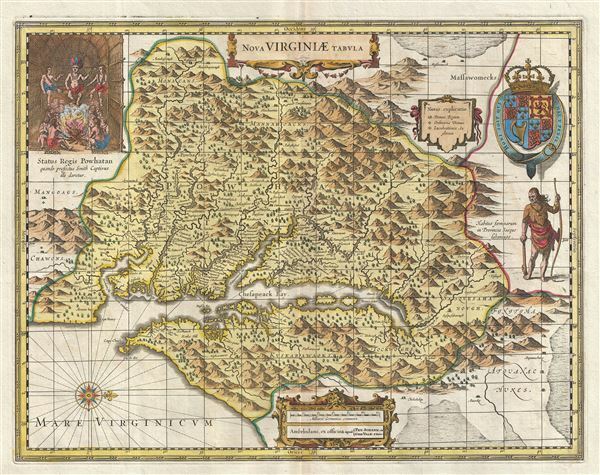 There are a number of different editions of this map and its publication by various map houses in various states made it the first widely distributed map of the Virginia colony and of John Smith's important map. There was, however, a scandal relating to its publication. The map was originally drawn and engraved in 1618 by Jodocus Hondius based upon the first edition of John Smith's 1612 map. When Jodocus died in 1629, he and his brother, Henricus Hondius, while collaborating on the Hondius Atlas Major, had established and maintained separate business for some 10 years. Jodocus' death enabled the competing cartographer, Willem Blaeu to acquire a large number of Jodocus' map plates, which he promptly published in 1630 as the Atlantis Appendix. Henricus, in the meantime, had been counting on Jodocus' new plates to enhance his own, by then outdated, Hondius Atlas Major. A surviving contract dated March 2, 1630 reveals that Henricus Hondius and his partner Joannes Janssonius hired engravers to produce a number of new map plates copying the work of Jodocus – now in the hands of the Blaeu firm. This map was among the most important on that list and accounts for the quantity of variants of this map issued by competing Blaeu and Hondius firms. This particular edition is known for being the only example of this map in which the American Indian at the right of the map is facing the Chesapeake Bay. Moreover, it is the last published map to follow the Smith/Hondius model. An essential map for Virginia collectors. Very good. Original centerfold. Wide original margins. Platemark visible. Old Color. Blank on verso. OCLC 60806160. Burden, P., The Mapping of America: A List of Printed Maps, 1151-1670, 228. Verner, Coolie, Map Collector's Circle # 45, 33-34. Verner, Coolie, 'Maps of Virginia in Mercator's Lesser Atlases', Image Mundi XVII, 45-61.